Nuclear power plants rely on cooling systems to ensure safe, continuous operation of the nuclear reactor. Cooling systems naturally ensure a heat transfer from a reactor core to steam generators, which is the main purpose of the cooling systems. Because of the large amount of heat generated in the reactor core by the fission reaction, the cooling systems demand a large volumetric flow of water (~80000 m3/hr) to ensure a sufficient and safe heat transfer. The cooling water is usually supplied by two or more large centrifugal pumps called reactor coolant pumps (RCPs). RCPs are not usually “safety system”, as defined. After the loss of RCPs the reactor must be shutdown immediately. Sufficient and safe residual heat removal is then ensured by a natural circulation flow through the reactor. However, natural circulation is not sufficient to remove the heat being generated when the reactor is at power. Reactor coolant pumps (RCPs) are used to pump primary coolant around the primary circuit. The purpose of the reactor coolant pump is to provide forced primary coolant flow to remove and transfer the amount of heat generated in the reactor core. There are many designs of these pumps and there are many designs of primary coolant loops. There are significant differences between pumps for different reactor types. This article is focused on RCPs for pressurized water reactors. Most of PWRs use four RCPs in two or four loops design. In general, a reactor can be shut down for many reasons. Sometimes a reactor can be shut down only to Hot Standby mode, that means the operating temperature is normally maintained. Such a shutdown usually (e.g. a shutdown following a turbine trip) does not require the Reactor Coolant System (RCS) to be cooled down and depressurized. After a reactor is shut down, provisions are provided for the removal of decay heat. When the reactor coolant system (RCS) is at a high pressure, the residual heat removal system (RHR) usually cannot be used for cooldown. In this case, decay heat is removed through the secondary system. For RCS cooldown (to Hot Standby mode), steam generators usually dissipates heat directly to the main condenser or via the atmospheric steam dump system. 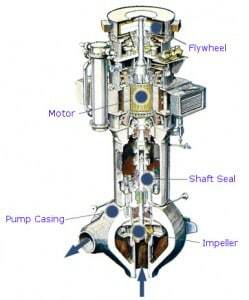 In this operational mode a some of reactor coolant pumps (RCPs) must be in operation. Proper loop flow and desired loop temperatures are maintained with these RCPs until the residual heat removal system (RHRS) is in service. If the plant is to remain in this condition for some period of time, SDM must be maintained (including xenon transients) by changes in boron concentration. 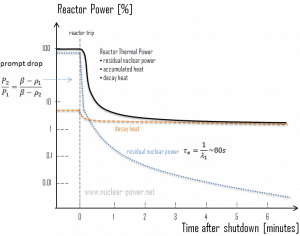 If the shutdown period will be lengthy or involves functions requiring cooldown of the reactor (e.g. shutdown for refueling), the system temperature and pressure can be lowered by a number of methods. 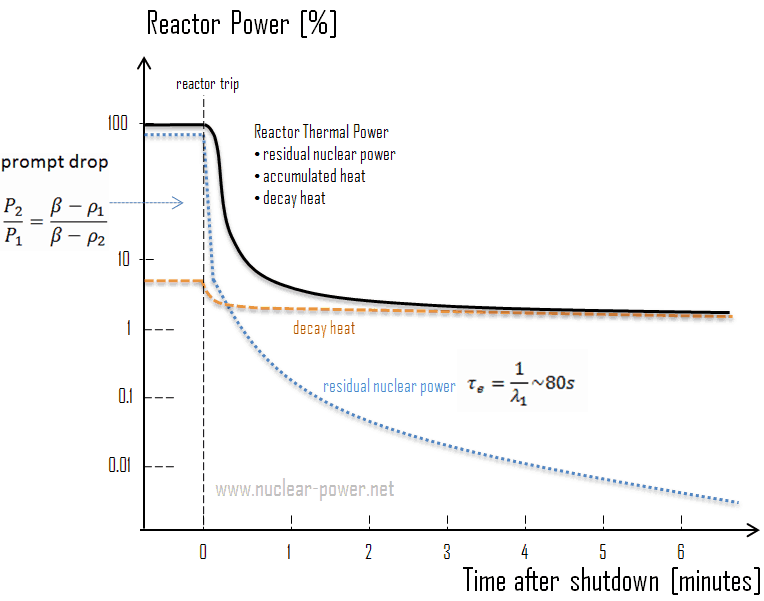 The methods for actually conducting cooldown of the reactor vary depending on plant design, but in all cases limitations are imposed on the maximum rate at which the reactor systems may be cooled. These limits are provided to reduce the stress applied to system materials, thereby reducing the possibility of stress induced failure. During this cooldown, the system pressure decreases as steam generator steam pressure decreases. SDM must be maintained also in this case, therefore boration is initiated to bring the boron concentration to the cold shutdown value. Reactor coolant pumps are run only as needed to assure uniform loops and reactor pressure vessel cooldown and to provide spray for pressurizer cooldown. When the RCS pressure is lower than the residual heat removal (RHR) system design pressure, this system is used for further cooldown, depressurization and long term reactor cooling. The RHR system in PWRs takes water from one or two RCS hot legs, cools it in RHR heat exchangers, and pumps it back to the cold legs or core flooding tank nozzles. To accomplish RHR heat removal, RHR heat exchangers transfer heat to the component cooling water or service water system, which then transports heat to the ultimate heat sink (UHS). The time required for plant cooldown is approximately 10 to 20 hours, which corresponds to cooldown rate of 15 to 30°C per hour. The final conditions are: the NSSS – Nuclear Steam Supply System is in the “cold shutdown” mode, that means Tavg = 30°C, pressure = near atmospheric, boron concentration is sufficient to yield 2 to 5% shutdown margin and RCPs – Reactor Coolant Pumps are off. Prior to each point of procedure above, compliance with the plant Technical Specifications must be verified.